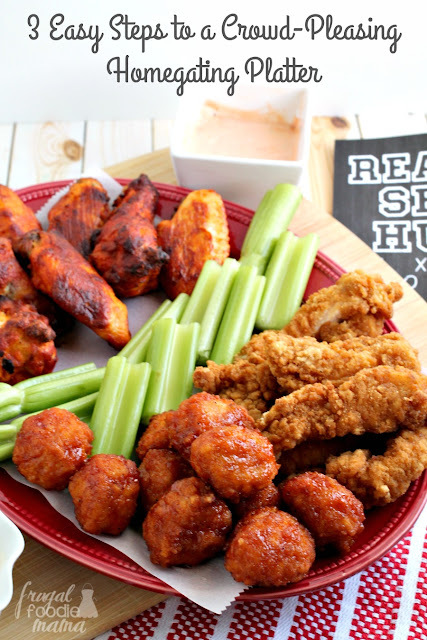 One of my favorite homegating dishes to throw together for a football party is an easy, yet crowd-pleasing platter. 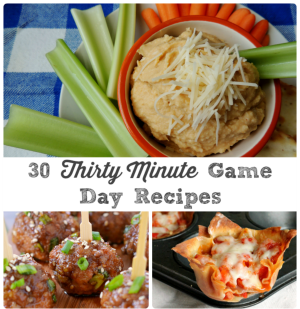 A tasty snack platter almost always serves as the star & the centerpiece of my game day spread. Once I have the platter made & ready to go, I can easily build the snack table from there with all the goodies that my party guests bring. Head to your local Kroger store (or Kroger division store) & pick up your favorite Tyson® no antibiotics ever chicken products from the freezer aisle. 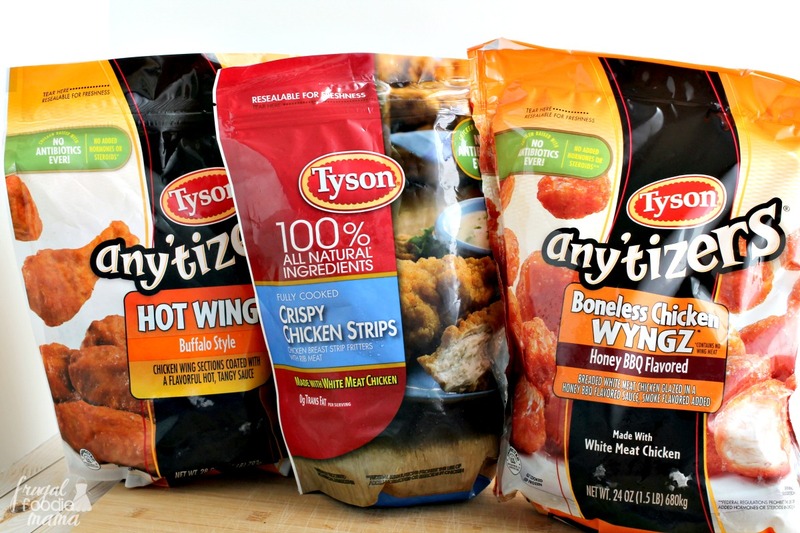 Might I suggest the Tyson® Any'tizers® hot wings buffalo style, a package of the Tyson® Any'tizers boneless chicken WYNGZ* in your favorite sauce, & some Tyson crispy chicken strips? 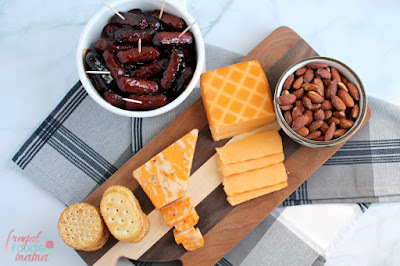 Tyson is my go-to when planning a homegating platter for a crowd because I love that all of their specially marked chicken products are made with no antibiotics ever. Their crispy chicken strips are made with 100% all-natural white meat chicken & come already fully cooked. Tyson® Any'tizers are also made from white meat chicken & come ready to go in a variety of different sauces. I just simply have to pop them in the oven & heat them until crispy. Plus, I can feel good about serving their hot wings, boneless chicken WYNGZ, & crispy chicken strips to my friends & family because they have no antibiotics ever and no added hormones or steroids. 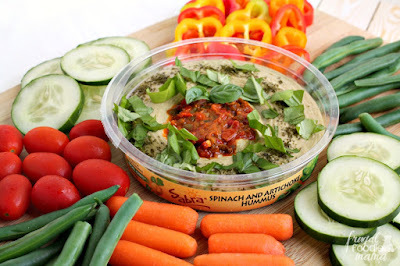 Brighten up that platter with some fresh veggies. Fresh celery stalks pair perfectly with anything that is spicy or made with buffalo sauce. Sometimes I also arrange a few handfuls of baby carrots in the center of the platter for a little more color & as another vegetable option for dipping & snacking. 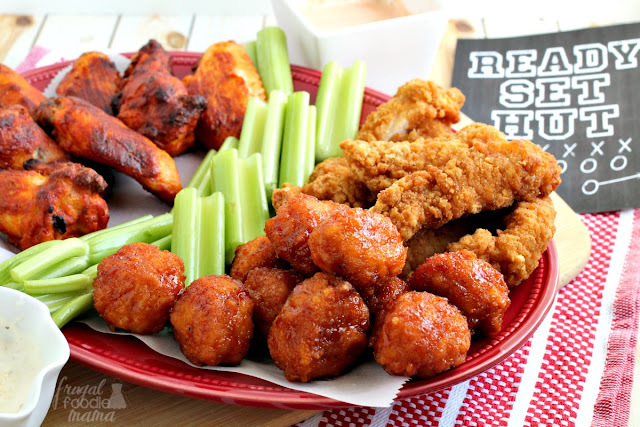 Whip up a few fun & easy dipping sauces for your Tyson wings & crispy chicken strips. 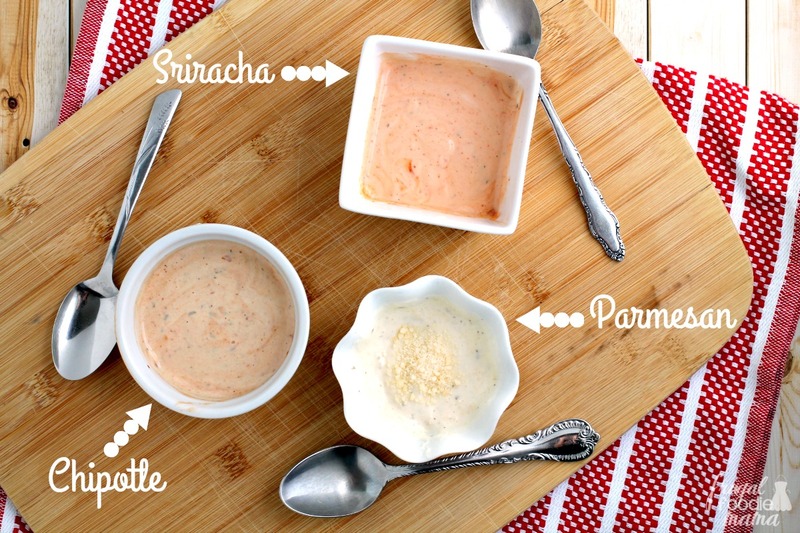 We are a big fan of ranch dressing in this house, so I like to divide it up into small bowls & then doctor them up with some of our other favorite sauces & mix-ins. Try 2 teaspoons of sriracha sauce mixed into about 1/3 cup of ranch dressing. Or stir in 2 tablespoons of the adodo sauce from a can of chipotle peppers for a smoky dipping sauce. For a non-spicy, kid friendly option, mix 2 tablespoons of grated Parmesan cheese into 1/3 cup of the dressing. 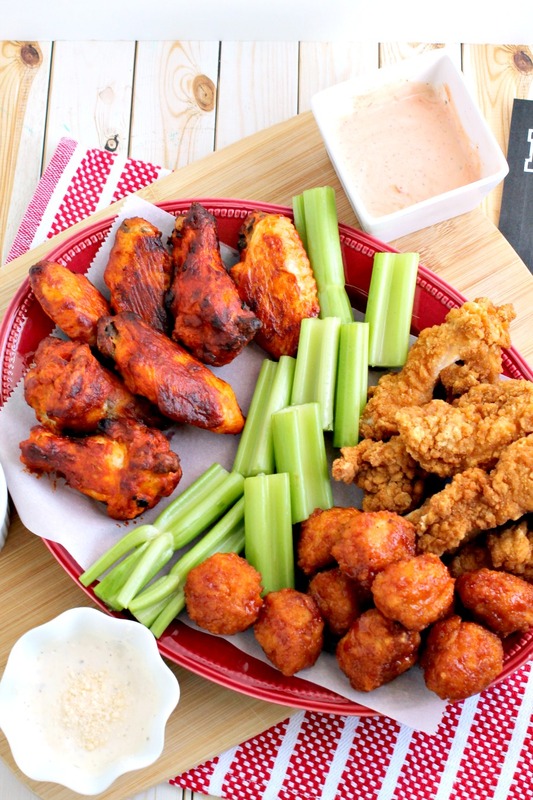 Serve the dipping sauces alongside your homegating platter. Provide the main dish (like this crowd-pleasing homegating platter I created with Tyson chicken products), but ask your party guests to bring extra side dishes and snacks. Place your homegating platter in the center of your snack table, & let your guests build around it as they bring in their dishes. Serve everything buffet style & keep it all self-serve so you can spend more time with your party guests enjoying the game. Keep clean-up after wards to a minimum and go with paper plates & plastic silverware. I also like to line my homegating platter with a sheet of parchment paper before I start adding on the chicken, vegetables, & sauces. Cleaning the platter can be as easy as throwing away the parchment paper. What are some of your best tips for keeping homegating entertaining easy & fuss-free?